Approximately 50 to 60 sq.ft per 20kg bag with 6mm X 6 mm square notch trowel for bed thickness of 3mm. Usage requirments are approximate.Coverage will depend on the trowel used and the condition of the subfloor. 400 Fixmoz thin-set tile adhesive is a polymer-modified and one-component glass mosaic adhesive,specially designed for the installation of glass mosaic on water body areas such as swimingpools,fountains,showers and bathroom. 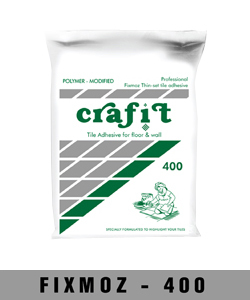 Approximately 80 sq.ft per 20 kg bag with 3mm*3mm square notch trowel for bed thickness of 1.5mm. Usage requirements are approximate.coverage will depend on the trowel used and condition of the subfloor.